THE ORFORD ORGAN STORY began in March 2017, when the University of Southampton made a gift of the Peter Collins organ built in 1977 for the Turner Sims Concert Hall, to Orford Church. The organ had originally been removed from the hall because of the threat of flooding from an underground river. After seven years in storage, the university decided it needed more space in the hall to accommodate a full symphony orchestra, and set about finding a new home for the organ. As the grateful recipients of the organ, we had to quickly reunite all the parts – the bulk of the organ was in a shipping container at Bournemouth Airport, the console was at the late Peter Collins’s organ works in Melton Mowbray, and the blower (we subsequently discovered…) was still tucked away undisturbed in a void behind the stage at the Turner Sims. We were fortunate to engage Paul Hale, Organist Emeritus of Southwell Minster, as our Independent Organ Adviser; the Leicestershire firm of Cousans Organs Ltd – who now had among their staff, members of Peter Collins’s team who had worked on the organ throughout its life – were appointed to secure the instrument, to make an inventory, and to carry out the full restoration we envisaged. The urgency of the task meant that we had to find a suitable storage location near Orford, and fast. This part of Suffolk is home to two large redundant airbases – RAF Woodbridge and RAF Bentwaters, and the Collins organ soon found a home in a (literally) bomb-proof location: a former nuclear bomb store in a secure compound, which had the advantage of plenty of space to lay the parts out for inspection, and cool, stable climactic conditions. The organ remained at Bentwaters until September 2017, when it was removed to the Cousans Organs’ works in Coalville, near Leicester, while we set about the process of securing a Faculty to install it from the Diocese of St Edmundsbury. This process took until August 2018. In the meantime, we had brought the case, console and display pipes to Orford, where they remained from December 2017 until spring 2018, allowing the congregation and visitors to see and admire it in its proposed new home – an underused part of the church’s north aisle. We are now in the process of raising around £120,000 for a restoration which will deliver in effect a new organ, at last giving Orford Church an instrument which is worthy of its musical patrimony and which will open up wonderful new opportunities within services, and for concerts, teaching and community events. Our target date is to dedicate the organ on Easter Sunday, 21 April 2019, with an inaugural Organ Festival from 10-12 May. You can help us realise our plans by donating through our Justgiving page. Watch this space for further updates and photos as the project develops. 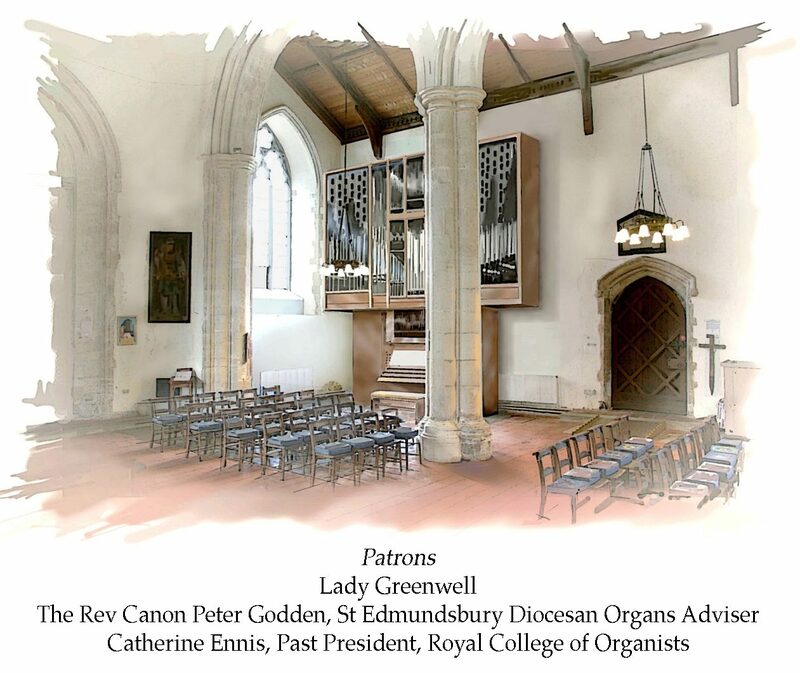 For further details of the Orford Organ Project, email orfordorganproject@gmail.com; for details of opportunities for giving, email Ciara Scallon – ciara@thegivingheart.co.uk.